In pre-algebra you practiced squaring numbers and memorizing the square roots of perfect squares. In algebra, we begin taking roots further than just the 'square' so being proficient in square roots is really handy. Let's do some review before we go further, shall we? This is often called the 'square root sign' but it is used for other roots, too! People will often say, "Simplify the radical" when they really mean, "Simplify the radicand." 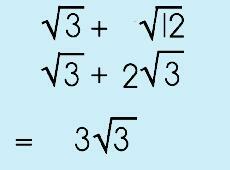 For square roots we do not write a 2 as it is assumed. For other roots we write the number inside the check mark to indicate the root. Sometimes you will have to do computations with radicals and this may just freak you out. Take a chill pill! Think of radicals as just another variable term and they won't be so difficult. Let me show you what I mean. The rule for adding and subtracting with radicals is simple: like I said before, think of it as a variable. You can only add radicals if the radicands are the same (think, 'like terms'). Just add or subtract the coefficients. IF you are adding/subtracting with radicals and you notice the radicands are not the same, check to see if you can simplify the radical(s). This may be a necessary step BEFORE you do any computation! Uh oh…radicands aren't the same! Step 2: Combine them under one radical sign. Step 3: Multiply all the terms under the radical sign. And, you should ALWAYS check to see if you can simplify…and, of course, you can in this case! You might be thinking, "What in the heck do I do if there's one of those weird problems where there's a term OUTSIDE of the radical sign? What do I do then?" Yikes! Toooo complicated! Ha! This is another easy problem. You add ONE new step! Step 1: Take your two OUTSIDE terms and multiply them. Step 2: Take your two radical terms and multiply them. Okay, now that you've done some multiplying with radicals I want you to think about this…what do YOU think you are going to do when you DIVIDE with 'em? Any idea? I betcha have one, right? It's going to be like the multiplication with radicals but with a teensy-weensy difference; you divide instead! Woo-hoo! Step 2: Combine them under one gigantic radical sign. Step 3: Divide all the terms under the radical sign. This is probably the weirdest thing you will deal with when working with radicals but it isn't difficult so don't stress out. All it means when you hear the phrase, "rationalize the denominator' is to turn the radical that is in the denominator into a whole number OR into a rational term. That's it! The way to do it is to use one of my faves…you'll recognize it. In this case, it isn't necessary but sometimes you may have to. Step 2: Multiply the numerator and denominator by the RADICAL in the denominator. Step 3: Simplify the numerator. You can see that the denominator now becomes the radicand minus the radical sign and there is no radical sign as a denominator. Sometimes you may need to rationalize a number where the fraction is paired with a radical. You can use a conjugate pair to rationalize the denominator! A conjugate pair is a binomial factor together which together with its original forms a product that is the difference of two squares. Wooo, what a moutful. Where can this be used? Why, you can use it to remove radicals from the denominator (I mean, really, who wants to deal with radicals in the denominator, for heaven's sake?). Let's try it. 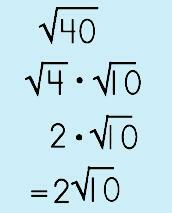 Say, you have a problem like the following and you are asked to rationalize the denominator. How would you do that? Step 1: Multiply by the conjugate pair. Think of fractions! You are going to multiply the numerator AND denominator by the conjugate pair because by doing so, you are basically multiplying by 1! 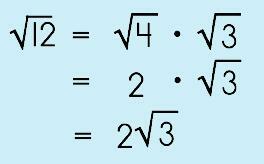 The radicals will 'disappear' and all that is left will be rational numbers in the denominator. Simplify. Voila!